Student debt in the U.S. is becoming a serious problem. Some are calling it Sub-Prime 2.0. Recently, the amount of student debt in the U.S. topped $1 Trillion and it looks like that number is going to do nothing but rise. A big problem lies with the 15 percent of student borrowers who have private student loans, compared to federally subsidized loans. Most people don’t understand the difference between the two types of loans. The reality is that private loans can lead to a lifetime of debt if not careful. Institutions like Fannie Mae and JP Morgan Chase back private student loans and they charge a variable interest rate that can climb into the double digits. Federal subsidized loans can be as much as half of that. A recent story on Bloomberg TV stated that one student signed up for a private student loan online as an 18 year old and it was as easy as signing up for iTunes. I am lucky that my parents did a great job saving for my college education and I have never had to worry about paying back student loans. I can only imagine what someone who has $100,000 worth of student debt at a 10 percent interest rate must be going through. Knowing that every month your payments are going towards paying down the accruing interest charges and you are not even making a dent in the principle amount is something no one wants. Luckily, there are some ways that you can get a great education, work in the career field you want to and also leave college debt free. Over the past several years, many of the top universities have adopted a no-loan or few loans policy. This is an attempt for the universities to use their large endowment funds to help reduce the debt of their graduating students. In 2010, the cost of tuition at Yale was $51,573. The cost after a need-based award for families earning $120,000 was $15,800. The cost for a family earning $80,000 would be just $6,467. This helps allow the tuition costs for private schools to be more inline with their state school counterparts. Yale is currently just one of over 50 college or universities that has started to help students eliminate debt at graduation. So you are paying $30,000 a year to get a degree in music and now you’re thinking about graduate school, huh? Don’t get me wrong; there is nothing wrong with a music degree. However, unless you have an inside track on being the next Lady Gaga, it might take you awhile to payback the more than $100,000 in student debt you will have by the time you are finished. To justify the high tuition you are paying, you need to make sure you are going to be able to pay back your debt quickly. If not, it might be time to reconsider your choice of majors. While I might not have needed to worry about paying for my own tuition for a secondary education masters degree, I still had a job while I was in college. I needed this to be able to afford to go out with friends, buy my food and any other things I might have wanted to do. I knew several people who were paying their own way through college and they held multiple jobs to be able to graduate without as much debt hanging over the heads. I am a supporter of college student credit cards, because they are a great way to start building good credit at a young age. It is, however, extremely important that you use them sparingly even if you do get approved for the best student credit card. By becoming too dependent on your credit card, you can find yourself in a lot of trouble. Starting at a two-year college is the choice of many college students. Two of my friends even went this route. They were able to get most of the core classes taken care of and save a lot of money. After they had their two-year degree, they transferred to The University of Iowa. One thing that you need to be careful about if you go this route, is making sure that all of your community college credits will transfer. Because of how much college tuition has increased over the past several years, taking a year off after high school has become a popular choice. Instead of going directly to college from high school, you could take a year off to work. This will help you save up money and allow you to wrap up college in a better financial position. Compared to everyone else in my grade, I was young when I graduated high school. I probably would have been much better off had I taken a year to mature before heading off to college. I was much more a fan of having fun then I was of actually picking up a textbook to study. It wasn’t until a couple of dropped classes (wasted money) and a near miss at academic probation, did I finally get myself on track. College tuition is getting more and more expensive each year. Until individual states of the federal government come up with a solution, students need to do whatever it takes to ensure a little to zero debt when they enter the workforce. Nice post. I am actually working on something similar for my site later in the week. It is difficult, but there are ways to lower costs associated with college. I went to community college myself and that saved a ton of money. It was something like $22/credit hour at the time so I could get the first two years done at a fraction of the cost. Starting at a community college is a great way to do things. Not only is it cheaper but its a good way to gradually work your way from high school to college. Great post. I’m a big advocate for taking a year off if you’re not totally sure what you want. There is too much pressure on high school students to jump right into it with little real career advice. High schools do such a good job at encouraging you to ‘follow your dreams’ that they neglect the little clause that often your dreams lead no where and with a boatload of debt. Not that I would ever NOT encourage my child to purse a passion or dream but taking a year off, away from highschool drama, working for a year will allow them to really discover themselves and make better decisions. I think the only drawback is that you have to have the dedication to actually go to college after the year off. I graduated with debt, but I did as much as I could to minimize it. I attended college classes while in high school and was able to eliminate one semester of college because of that. I also took 14 credits (maybe 16? I can’t remember) during one summer at the local community college to knock out some of my gen-eds. I wish I had taken AP classes in high school. I had friends who did it and like you they came in with a semester worth of credit. Good suggestions. Another idea is to get a regular job at the university you want to go to and use free tuition benefits to take classes for free in the evenings/weekends and spare time. That’s what I did with my second degree. That’s a great suggestion. A friend from high school had a parent who was a professor so they received free tuition. While I like the “get a job” advice, I think you want to weigh it carefully. It took me 7 years to get through my BA program because I got a job. In hindsight, I should have saved the time and taken on some debt. I would have been three years ahead of the game. I hear you. There needs to be balance. Like always, another article with Great Points Sean! Student debt is an alarming problem here. Another option is joining the military either before or after school. The new post 9/11 GI Bill is awesome. It came out while I was serving and I used it after getting out to finish my degree. It really helps job-wise if you major in something that pays decently. Even before you graduate, you can get internships that pay better than just being a waiter or whatever. I finished a BS in computer science in 2003, and I don’t think I earned less than $20/hour any of the summers I was in school. A lot of those jobs continued into or through the year too. That worked out to about $10,000 a summer, which goes a long ways at a state school. $10k during a summer in college is awesome. Get someone else to pay your living expenses. Live at home with your parents if you’re going to a nearby CC, or after living in the dorms for a year, most colleges let undergrads apply for RA positions that come with free housing, food, and a small stipend. The work was easy and the cost savings were huge! RA positions is a good addition. Can;t believe I forgot to add that. I am pretty sure at the University of Iowa they gave RA’s free living and then something around $2k per semester. The No loan initiative is awesome! Another way to approach the transfer thing is to look at your target college, and look at the cheapest college from which your target college accepts transfers. Enroll there, get a stellar GPA and the transfer will even be easier than applying right out of high school to your target college. Some of the endowments are at crazy high levels that they can easily afford to start helping kids that come from certain income levels. I graduated in the middle of a recession. Nobody wanted to hire me, and nobody cared about my degree, gpa, or where I went to school. The same may be said of many of today’s graduates. Many students are not getting a return for what they spend on education. I finally got a job once I learned how to make myself valuable to an employer, and advanced after learning while on the job. An alternative to getting a job, is skipping school altogether and the inflated tuition, and starting a business. Bill Gates does not regret the move. My sister-in-law just graduated and she had decided to go back to school. She even had a hard time finding a part-time job once she moved back home and started taking classes again. I love that schools like Yale and Stanford offer reduced tuition if you family is not wealthy, but not everyone is going to be able to get accepted to those type schools. I think state school or community college is a great place to start, but the most important part of this post is to choose a degree that goes along with your amount of debt. I love that people want to go into teaching and other lower paying careers, but you can’t make it with $100K in student loans. I went to a state school and it had one of the top 50 business programs in the US. Could I have gone to a private top tier school? Yes, but I got a great education for a lot less money. I had no idea about the no-loan universities! Kudos to them. Makes me want to be aware if I’m ever applying places for a degree higher than what I’m working towards now. I’m utilizing a ton of scholarships to get where I need to be. I personally never went to college but my twin brother did. He did a lot of the things you mentioned like going to a community college first to take his core classes and then transferred to another college to finish out his degree. He also switched majors from CAD to Computer Science a much tougher degree but one he likes very much. On top of that he also got a job working as a low level techie for a medical manufacturing company in my area. After college he was able to go full time with them because he already had the experience and as a result moved up the corporate ladder much faster. Finally, as an added benefit the company even agreed to pay a portion of his tuition once he finished college. So anyone planning to go to college I would have to say get a degree in something that is in demand such as healthcare or technology and make yourself irreplaceable. Thats awesome Chis. I like hearing stories of companies that will pay for their employers education. That is a sign of a good employer because they want to help advance their employees future. One of my biggest regrets was not applying to a school that was going to offer a full ride. Instead, I went to a school that I needed loans to diligent my scholarship and then proceed to lose my scholarship. What made you make that choice if you don’t mind me asking? The absolute worst reason of all. Procrastination. “I’ll take care of the application on the weekend” and when I finally got around to it, the admissions deadline had passed. This post would have been useful to me…six years ago 😉 Still, great advice! Same for me. I wish I had known this kind of stuff before I went to college. It would’ve saved a lot of money. I think one of the most effective strategies is to pick a marketable major, and then work as much as possible during school. My undergraduate degree is in computer science, and I usually worked at programming jobs in the summers and as much as possible during the school year. As a result I covered all but about $10K of my education & room/board at a flagship state school. Thankfully my dad covered the rest, but it wouldn’t have been a problem to pay off $10K of loans if need be. Working as much as possible during college is tricky since it can jeopardize your education somewhat. As a result you might not have enough time to properly study or you might suffer from burnout. So you need to properly consider the amount of workload you already have before pursuing additional work. A marketable major is a must though. If you go to school for something that just isn’t in demand, you might put yourself in debt and not even be able to find relevant work. One of the serious problems is when these students tack on more and more debt through private loans, and in addition take a degree program that isn’t very applicable nor easily transferable to the workforce. This is something where your tip about getting a job through school can provide money but also the experience to pay off some debts after finishing college/university. The massive amount of student debt today is insane to be honest, it concerns me since it’s preventing people from going to university/college and further widening the rich to poor gap. I think students just don’t realize how big a problem student debt is. When it seems like the norm, they quickly rack up a ton of debt figuring they can easily pay it back later. They don’t consider the possibility of not being able to find work or not getting the wage you assume you deserve. If your degree does give you transferable skills you do stand a much better chance of getting out of debt quicker. It’s very possible to be a debt-free college graduate! There is often some sacrifice involved, but it’s well worth it in the end to know that your future income is your own, and you’re not tied down to student loan payments for the foreseeable future. 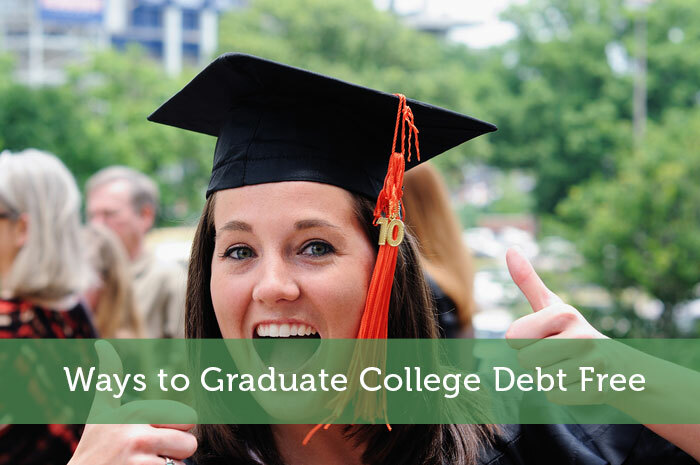 I was lucky to be a debt-free grad, but others can do the same with careful planning and forethought! Good luck to all college-bound high school seniors and their families this year – and congratulations to December’s grads! It would be so satisfying to graduate debt free. To get 100% of your income from the start just makes it so much easier to start your post-college life. If only young people got more education about how they can achieve that before they even choose a school and major.